old flute carved from the wing bone of a crane. with the unseen source of life they call breath. that Athenian throats would utter if only they could. a transcending of selves, a republic. Born and raised in Michigan (1927) and a longtime resident of the Washington, DC area, Rod Jellema is Professor Emeritus of English and former Director of Creative Writing at the University of Maryland. Since he began work as a poet in mid-career at age 40, five books have been published: Something Tugging the Line (1973), The Lost Faces (1978), The Eighth Day: New and Selected Poems (1985), A Slender Grace (2005), and his most recent book (which includes a CD), Incarnality: The Collected Poems (2010). He has also published two award-winning books of selections and translations from Frisian poetry: Country Fair (1985) and The Sound that Remains (1989). 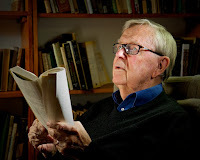 The father of three sons, married to the writer Michele Orwin, he is presently writing essays on the reading, writing, and teaching of poetry. Eleven of these essays have been recently published in three journals, Innisfree Poetry Journal, Poet Lore, and International Poetry Journal. He is at work on a book of such essays, Riding the Undercurrent.